In the previous post I gave a brief introduction to Rainier, a new HMC-based probabilistic programming library/DSL for Scala. In that post I assumed that people were using the latest source version of the library. Since then, version 0.1.1 of the library has been released, so in this post I will demonstrate use of the released version of the software (using the binaries published to Sonatype), and will walk through a slightly more interesting example – a dynamic linear state space model with unknown static parameters. This is similar to, but slightly different from, the DLM example in the Rainier library. So to follow along with this post, all that is required is SBT. set libraryDependencies  += "com.stripe" %% "rainier-plot" % "0.1.1"
This should give a Scala REPL with appropriate dependencies (rainier-plot has all of the relevant transitive dependencies). We’ll begin with some imports, and then simulating some synthetic data from a dynamic linear state space model with an AR(1) latent state and Gaussian noise on the observations. iterate(0.0)(x => mu + (x - mu) * a + sig * rng.standardNormal). Now we have some synthetic data, let’s think about building a probabilistic program for this model. Start with a prior. Note the use of a case class for wrapping the static parameters. Next, let’s define a function to add a state and associated observation to an existing model. Given this, we can generate the probabilistic program for our model as a fold over the data initialised with the prior. If we don’t want to keep samples for all of the variables, we can focus on the parameters of interest, wrapping the results in a Map for convenient sampling and plotting. Rainier is a monadic embedded DSL for probabilistic programming in Scala. We can use standard functional combinators and for-expressions for building models to sample, and then run an efficient HMC algorithm on the resulting probability monad in order to obtain samples from the posterior distribution of the model. See the Rainier repo for further details. In previous posts I have explained why I think that Scala is a good language to use for statistical computing and data science. Despite this, R is very convenient for simple exploratory data analysis and visualisation – currently more convenient than Scala. I explained in my recent talk at the RSS what (relatively straightforward) things would need to be developed for Scala in order to make R completely redundant, but for the short term at least, it seems likely that I will need to use both R and Scala for my day-to-day work. Since I use both Scala and R for statistical computing, it is very convenient to have a degree of interoperability between the two languages. I could call R from Scala code or Scala from R code, or both. Fortunately, some software tools have been developed recently which make this much simpler than it used to be. The software is jvmr, and as explained at the website, it enables calling Java and Scala from R and calling R from Java and Scala. I have previously discussed calling Java from R using the R CRAN package rJava. In this post I will focus on calling Scala from R using the CRAN package jvmr, which depends on rJava. I may examine calling R from Scala in a future post. from the R command prompt. The package has the usual documentation associated with it, but the draft paper describing the package is the best way to get an overview of its capabilities and a walk-through of simple usage. For illustration I’m going to use a Scala implementation of a Gibbs sampler which relies on the Breeze scientific library, and will be built using the simple build tool, sbt. Most non-trivial Scala projects depend on various versions of external libraries, and sbt is an easy way to build even very complex projects trivially on any system with Java installed. You don’t even need to have Scala installed in order to build and run projects using sbt. I give some simple complete worked examples of building and running Scala sbt projects in the github repo associated with my recent RSS talk. Installing sbt is trivial as explained in the repo READMEs. override def toString: String = x.toString + " , " + y + "\n"
This code requires Scala and the Breeze scientific library in order to build. We can specify this in a sbt build file, which should be called build.sbt and placed in the same directory as the Scala code. "org.scalanlp" %% "breeze-natives" % "0.10"
sbt "run output.csv 50000 1000"
This works fine, but won’t work so well for code which needs to be called repeatedly. For this, tighter integration between R and Scala would be useful, which is where jvmr comes in. jvmr provides a very simple way to embed a Scala interpreter within an R session, to be able to execute Scala expressions from R and to have the results returned back to the R session for further processing. The main issue with using this in practice is managing dependencies on external libraries and setting the Scala classpath correctly. For an sbt project such as we are considering here, it is relatively easy to get sbt to provide us with all of the information we need in a fully automated way. With this function at our disposal, it becomes trivial to call our Scala code direct from the R interpreter, as the following code illustrates. Here we call the getIters function directly, rather than via the main method. This function returns an immutable List of States. Since R doesn’t understand this, we map it to an Array of Arrays, which R then unpacks into an R matrix for us to store in the matrix out. The CRAN package jvmr makes it very easy to embed a Scala interpreter within an R session. However, for most non-trivial statistical computing problems, the Scala code will have dependence on external scientific libraries such as Breeze. The standard way to easily manage external dependencies in the Scala ecosystem is sbt. Given an sbt-based Scala project, it is easy to add a task to the sbt build file and a function to R in order to initialise the jvmr Scala interpreter with the full classpath needed to call arbitrary Scala functions. This provides very convenient inter-operability between R and Scala for many statistical computing applications. On Friday the Royal Statistical Society hosted a meeting on Statistical computing languages, organised by my colleague Colin Gillespie. Four languages were presented at the meeting: Python, Scala, Matlab and Julia. I presented the talk on Scala. The slides I presented are available, in addition to the code examples and instructions on how to run them, in a public github repo I have created. The talk mainly covered material I have discussed in various previous posts on this blog. What was new was the emphasis on how easy it is to use and run Scala code, and the inclusion of complete examples and instructions on how to run them on any platform with a JVM installed. I also discussed some of the current limitations of Scala as an environment for interactive statistical data analysis and visualisation, and how these limitations could be overcome with a little directed effort. Colin suggested that all of the speakers covered a couple of examples (linear regression and a Monte Carlo integral) in “their” languages, and he provided an R solution. It is interesting to see the examples in the five different languages side by side for comparison purposes. Colin is collecting together all of the material relating to the meeting in a combined github repo, which should fill out over the next few days. For other Scala posts on this blog, see all of my posts with a “scala” tag. Doucet, Arnaud, Michael Pitt, and Robert Kohn. Efficient implementation of Markov chain Monte Carlo when using an unbiased likelihood estimator. arXiv preprint arXiv:1210.1871 (2012). Pitt, Michael K., Ralph dos Santos Silva, Paolo Giordani, and Robert Kohn. On some properties of Markov chain Monte Carlo simulation methods based on the particle filter. Journal of Econometrics 171, no. 2 (2012): 134-151. Sherlock, Chris, Alexandre H. Thiery, Gareth O. Roberts, and Jeffrey S. Rosenthal. On the efficiency of pseudo-marginal random walk Metropolis algorithms. arXiv preprint arXiv:1309.7209 (2013). I have discussed psuedo marginal MCMC and particle MCMC algorithms in previous posts. It will be useful to refer back to these posts if these topics are unfamiliar. Within particle MCMC algorithms (and psuedo-marginal MCMC algorithms, more generally), an unbiased estimate of marginal likelihood is constructed using a number of particles. The more particles that are used, the better the estimate of marginal likelihood is, and the resulting MCMC algorithm will behave more like a “real” marginal MCMC algorithm. For a small number of particles, the algorithm will still have exactly the correct target, but the noise in the unbiased estimator of marginal likelihood will lead to poor mixing of the MCMC chain. The idea is to use just enough particles to ensure that there isn’t “too much” noise in the unbiased estimator, but not to waste lots of time producing a super-accurate estimate of marginal likelihood if that isn’t necessary to ensure good mixing of the MCMC chain. The papers above try to give theoretical justifications for certain “rules of thumb” that are commonly used in practice. One widely adopted scheme is to tune the number of particles so that the variance of the log of the estimate of marginal liklihood is around one. The obvious questions are “where?” and “why?”, and these questions turn out to be connected. As we will see, there isn’t really a good answer to the “where?” question, but what people usually do is use a pilot run to get an estimate of the posterior mean, or mode, or MLE, and then pick one and tune the noise variance at that particular parameter value. As to “why?”, well, the papers above make various (slightly different) assumptions, all of which lead to trading off mixing against computation time to obtain an “optimal” number of particles. They don’t all agree that the variance of the noise should be exactly 1, but they all agree to an order of magnitude. All of the above papers make the assumption that the noise distribution associated with the marginal likelihood estimate is independent of the parameter at which it is being evaluated, which explains why there isn’t a really good answer to the “where?” question – under the assumption it doesn’t matter what parameter value is used for tuning – they are all the same! Easy. Except that’s quite a big assumption, so it would be nice to know that it is reasonable, and unfortunately it isn’t. Let’s look at an example to see what goes wrong. Again, see the relevant previous post for details. So now mLLik() is a function that will return the log of an unbiased estimate of marginal likelihood (based on 150 particles) given a parameter value at which to evaluate. What we are currently wondering is whether the noise in the estimate is independent of the parameter at which it is evaluated. We can investigate this for this filter easily by looking at how the estimate varies as the first parameter (prey birth rate) varies. The following code computes a log likelihood estimate across a range of values and plots the result. 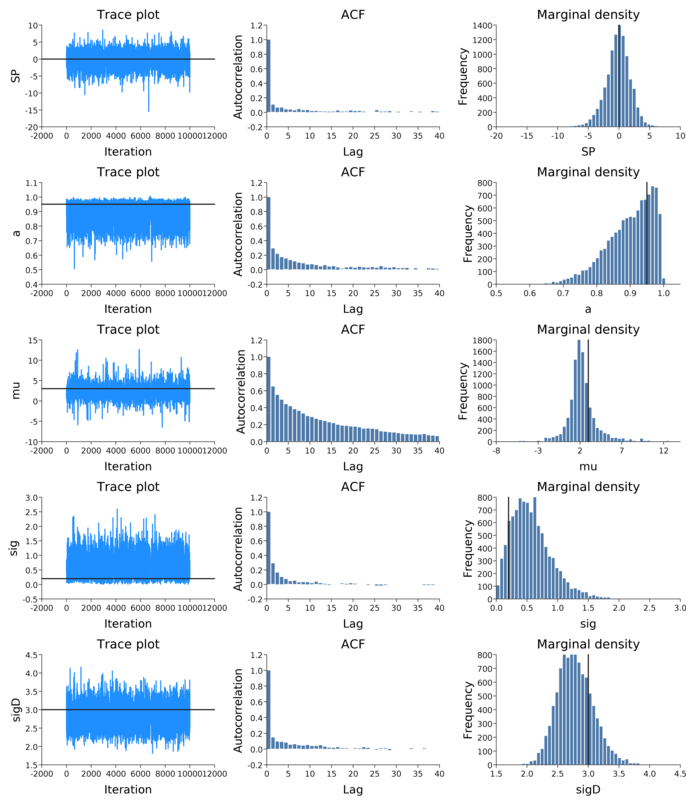 So, looking at the plot, it is very clear that the noise variance certainly isn’t constant as the parameter varies – it varies substantially. Furthermore, the way in which it varies is “dangerous”, in that the noise is smallest in the vicinity of the MLE. So, if a parameter close to the MLE is chosen for tuning the number of particles, this will ensure that the noise is small close to the MLE, but not elsewhere in parameter space. This could have bad consequences for the mixing of the MCMC algorithm as it explores the tails of the posterior distribution. In previous posts I have discussed general issues regarding parallel MCMC and examined in detail parallel Monte Carlo on a multicore laptop. In those posts I used the C programming language in conjunction with the MPI parallel library in order to illustrate the concepts. In this post I want to take the example from the second post and re-examine it using the Scala programming language. Before constructing a parallel implementation, we will first construct a slightly re-factored serial version that will be easier to parallelise. The simplest way to introduce parallelisation into Scala code is to parallelise a map over a collection. We therefore need a collection and a map to apply to it. Here we will just divide our iterations into separate computations, and use a map to compute the required Monte Carlo sums. We can now run this code with varying sizes of N in order to see how the runtime of the code changes as the size of the parallel collection increases. Timings on my laptop are summarised in the table below. So we see that the timings decrease steadily until the size of the parallel collection hits 8 (the number of processors my hyper-threaded quad-core presents via Linux), and then increases very slightly, but not much as the size of the collection increases. This is better than the case of C+MPI where performance degrades noticeably if too many processes are requested. Here, the Scala compiler and JVM runtime manage an appropriate number of threads for the collection irrespective of the actual size of the collection. Also note that all of the timings are faster than the corresponding C+MPI code discussed in the previous post. the pseudo-marginal algorithm which exploits the fact that the particle filter’s estimate of likelihood is unbiased is an MCMC algorithm which directly targets the marginal posterior distribution . 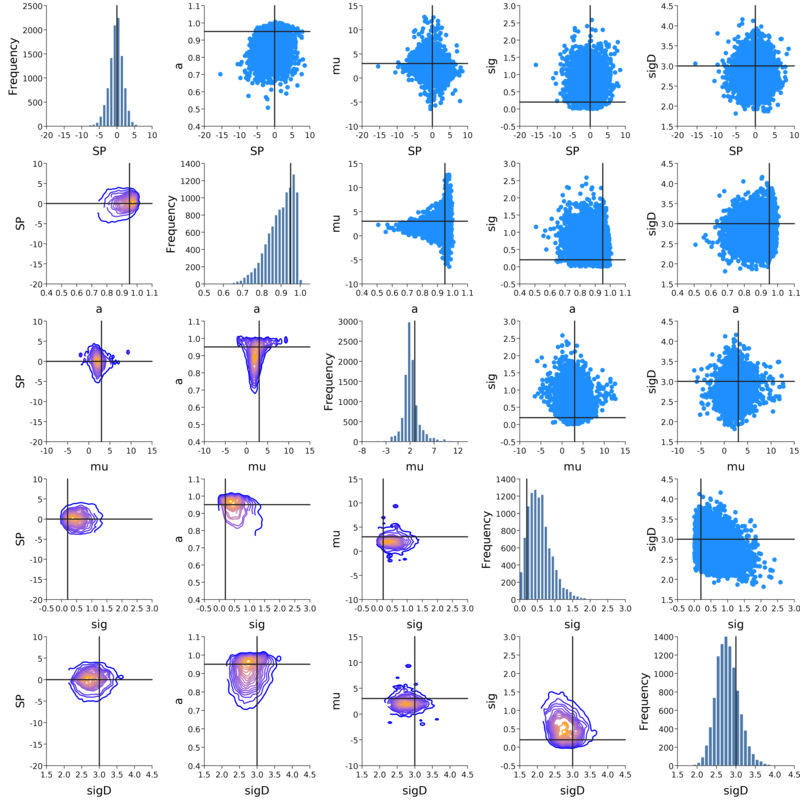 On the other hand, the PMMH algorithm is an MCMC algorithm which targets the full joint posterior distribution . Now, the PMMH scheme does reduce to the pseudo-marginal scheme if samples of are not generated and stored in the state of the Markov chain, and it certainly is the case that the pseudo-marginal algorithm gives some insight into why the PMMH algorithm works. However, the PMMH algorithm is much more powerful, as it solves the “smoothing” and parameter estimation problem simultaneously and exactly, including the “initial value” problem (computing the posterior distribution of the initial state, ). Below I will describe the algorithm and explain why it works, but first it is necessary to understand the relationship between marginal, joint and “likelihood-free” MCMC updating schemes for such latent variable models. As previously discussed, the problem with this scheme is that the marginal likelihood required in the acceptance ratio is often difficult to compute. The proposal mechanism ensures that the proposed is consistent with the proposed , and so the procedure can work provided that the dimension of the data is low. However, in order to work well more generally, we would want the proposed latent variables to be consistent with the data as well as the model parameters. Notice how the acceptance ratio simplifies, using the basic marginal likelihood identity (BMI) of Chib (1995), and drops out of the ratio completely in order to give exactly the ratio used for the marginal updating scheme. Thus, the “ideal” joint updating scheme reduces to the marginal updating scheme if is not sampled and stored as a component of the Markov chain. Understanding the relationship between these schemes is useful for understanding the PMMH algorithm. Indeed, we will see that the “ideal” joint updating scheme (and the marginal scheme) corresponds to PMMH using infinitely many particles in the particle filter, and that the likelihood-free scheme corresponds to PMMH using exactly one particle in the particle filter. For an intermediate number of particles, the PMMH scheme is a compromise between the “ideal” scheme and the “blind” likelihood-free scheme, but is always likelihood-free (when used with a bootstrap particle filter) and always has an acceptance ratio leaving the exact posterior invariant. where is the particle filter’s (unbiased) estimate of marginal likelihood, described in the previous post, and below. Note that this approach tends to the perfect joint/marginal updating scheme as the number of particles used in the filter tends to infinity. Note also that for a single particle, the particle filter just blindly forward simulates from and that the filter’s estimate of marginal likelihood is just the observed data likelihood leading precisely to the simple likelihood-free scheme. To understand for an arbitrary finite number of particles, , one needs to think carefully about the structure of the particle filter. 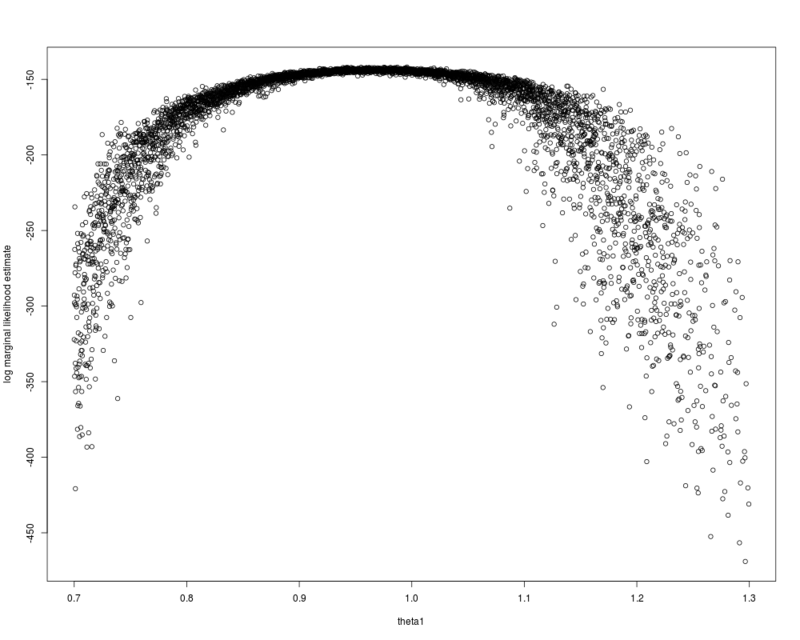 To understand why PMMH works, it is necessary to think about the joint distribution of all random variables used in the bootstrap particle filter. To this end, it is helpful to re-visit the particle filter, thinking carefully about the resampling and propagation steps. First introduce notation for the “particle cloud”: , , . Initialise the particle filter with , where and (note that is undefined). Now suppose at time we have a sample from : . First resample by sampling , . Here we use for the discrete distribution on with probability mass function . Next sample . Set and . Finally, propagate to the next step… We define the filter’s estimate of likelihood as and . See Doucet et al (2001) for further theoretical background on particle filters and SMC more generally. Thus the PMMH algorithm targets the correct posterior for any number of particles, . Also note the implied uniform distribution on the selected indices in the target. I will give some code examples in a future post.